Join Candace Cameron Bure, actress best known as D.J. 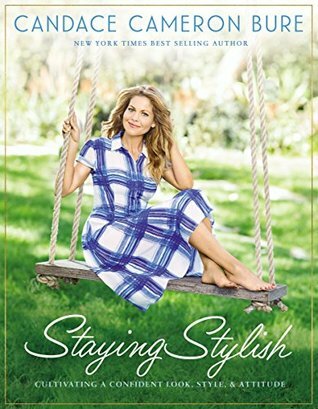 Tanner from Full House and a New York Times bestselling author, whose faith and wit have delighted audiences for decades, as she lets you in on her best-kept secrets for Staying Stylish. This gorgeous manual for beauty, style, health, and spiritual wellness will be your one-stop shop for everything you need to live your most stylish life. As an actress, producer, New York Times bestselling author, and inspirational speaker, Candace Cameron Bure has spent her entire life in the spotlight, and she is well aware of the pressures and forces many women face. Throughout her career, Candace has balanced her faith, family, and passion for work and found her spot as role model to women of all ages—and as a style icon. In her brand-new book Staying Stylish, Candace invites you behind the scenes of her day-to-day life and shares over 100 tips and tricks for looking and feeling your best—both inside and out. Nurture your body, style, and soul as you read through this beautiful book full of photos, insider secrets, and exciting ideas to revamp your own life into its best possible version. She offers her insight into balance, spiritual growth, and looking great while doing it all. I thought it would be fun to read a book about style, especially a gal who I know dresses modestly. I thought Candace had some great ideas and encouragement in each area of the book. This book goes beyond what to wear on the runway, exercise, casual days, make up, shoes, etc. She covers all of the basics in an easy to read and fun way. Now I certainly need to work on my style and Candace has a different taste in many things but she has great advice! If style is your thing, you will enjoy this book. If you have no idea what that means, this book could be helpful! The Lacemaker- A Must Read! A Simplified Life: A Great Read!